I also wanted a little collar to protrude from the center of the pulley. A grub screw will go through the collar to keep the pulley attached to the shaft. Here I’m sawing out a square of wood for the collar. 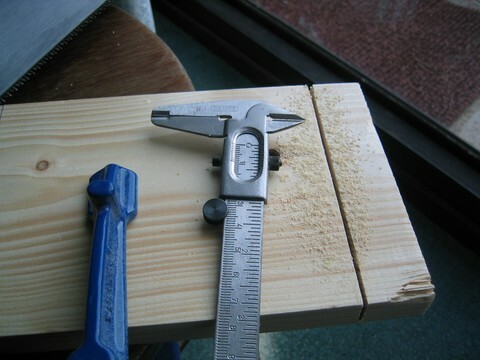 I also measured the thickness of the cut made by my saw, because I thought I might need to saw the wooden pattern in half (to make it easier to extract from the mould) and so I’d need to compensate for the thickness lost during sawing.